I know I’ve been absent for a LONG time, but I promise I’m trying to work on new inspiration. I have been keeping my Youtube and Instagram accounts fairly current though. If you’re interested in following me there the links are on the right hand side of the blog. I’ve also started a new health experience with Plexus which I also linked in the right tool bar. 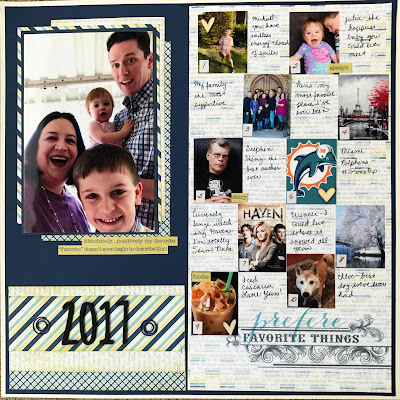 Without further ado…Here is a layout I completed with one of my scraptastic kits. It’s of our daughter when she was a month old starting to look and play with her little gym. The products are mostly Amy Tangerine with some stash items thrown in here and there. My favorite part of the layout though is the heart and title. The hearts were created with Faber Castel glass beads. I did a review of the product over on my youtube page…be sure to check it out. The title I made with my Silhouette Cameo sketch pens. Can I even tell you how much I loved the effect! 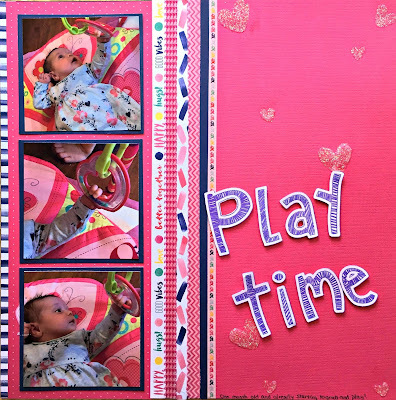 I’m up today with another Scrapbook Challenges layout, but it includes several firsts. It’s Julia’s blog debut first and foremost. She was only about two hours old in these photos! They are my Mom, Dad, Sister, Brother-In-Law and our son meeting her. 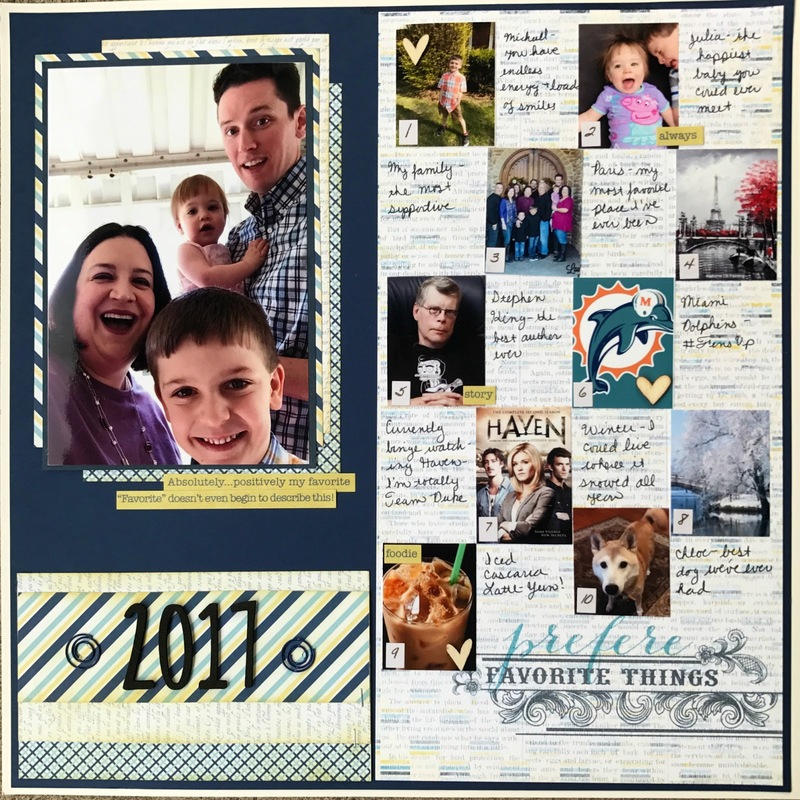 The second first is that this is my first scraptastic layout. When I saw their Drops of Jupiter kit in March and then Eloise in April I knew I had to sign up. 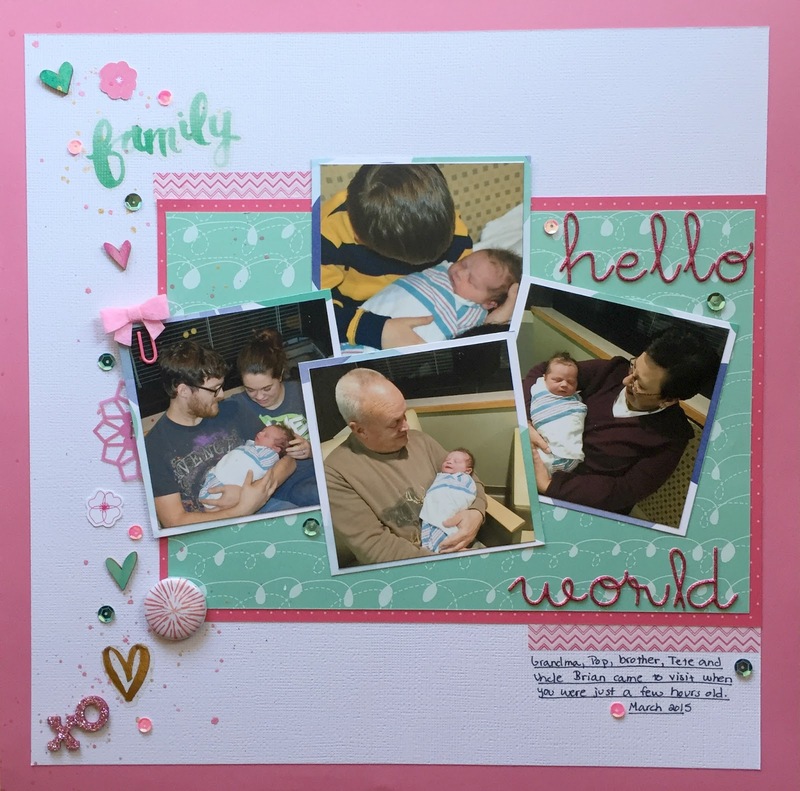 Everything on the layout, except for the pink background and the wood veneer hearts came from the kit. I love how it all worked together. Come back next week for a layout showcasing Julia’s newborn photo shoot pictures. I LOVE how it came out. If you following me on Instagram you’ve seen a sneak peak of my Partner’s in Crime layout for the new Lasting Memories Challenge using the February 15th sketch over at Stuck? I wasn’t able to submit this for the challenge, but I loved the sketch so much I wanted to it anyway. 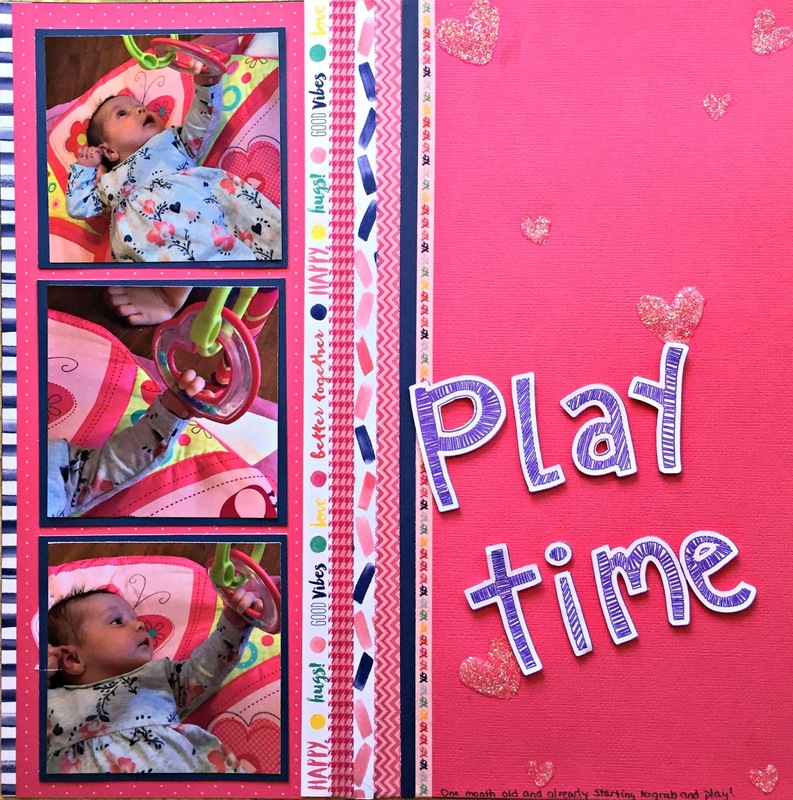 I used products from the My Mind’s Eye Remarkable collection for my paper choices. 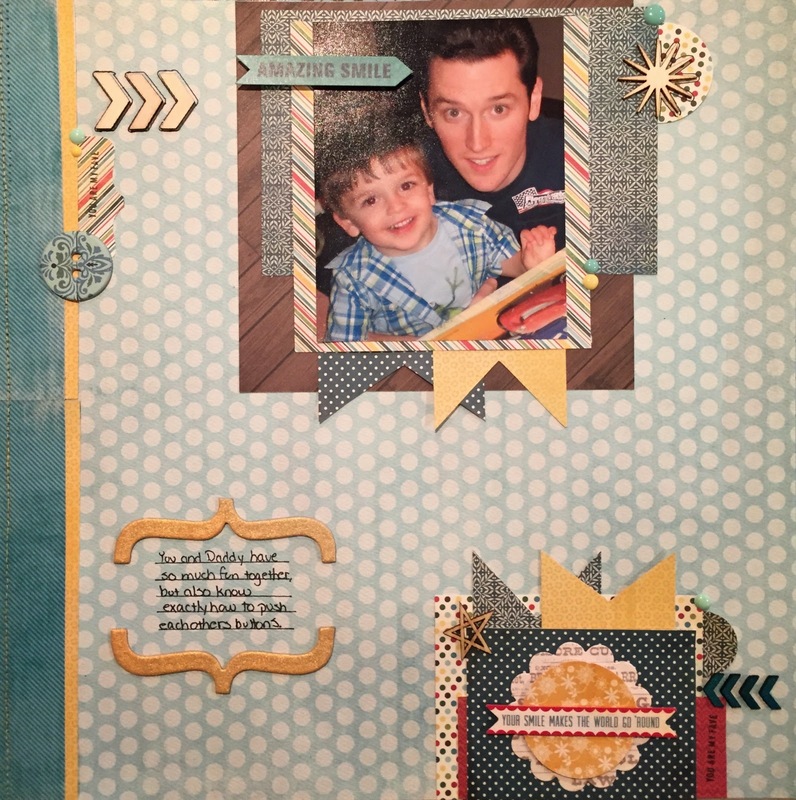 I also used some of the collections embellishments along with wood veneers from Studio Calico and sprays from Heidi Swap and Tattered Angels. I also used an Amy Tangerine roller stamp for stamping on my tags. I’m just so happy with how this one turned out. So who’s your partner in crime? Until next time…Keep Scrapping!